In June 2011, I had recently finished my A’level exams and my eagerness to begin my journey as an undergraduate student was at its peak. However, the tedious wait of two months before I enrolled as a student was getting to me. I had to make the wait worth awhile so I decided to volunteer in the meantime. I had never volunteered at a nongovernmental organization before and I had no idea about the challenges which were heading my way. I went ahead and spoke to the Care Foundation to let me volunteer at one of their government adopted schools. The school I volunteered at was called the Zamzama Government Primary School. They were very keen on letting me begin this new chapter of my life as a voluntary teacher to children from class 1 to 3 the very next day. That day I remember waking an hour before my alarm was meant to buzz, feeling nervous to meet the children I was going to teach. Thoughts such as, “Am I going to be able to teach them anything? Will I actually make them learn and discipline themselves? Are they going to respect me as their other full-time employed teachers?” ran through my head. I mustered up all the courage and positivity I had in me and got ready to go to school. Once I got there, I was called into the Principal’s office and he told me that I would be teaching English to classes 1 to 3. He handed me a set of English curriculum books that they were using. He told me that my first class would begin in fifteen minutes and until then I should familiarize myself with what is being taught. I went through the books and the responsible feeling of educating young brains breezed through me and filled me with joy. I sat there going through different English Language exercises and made a mental plan of what exactly I was going to teach. 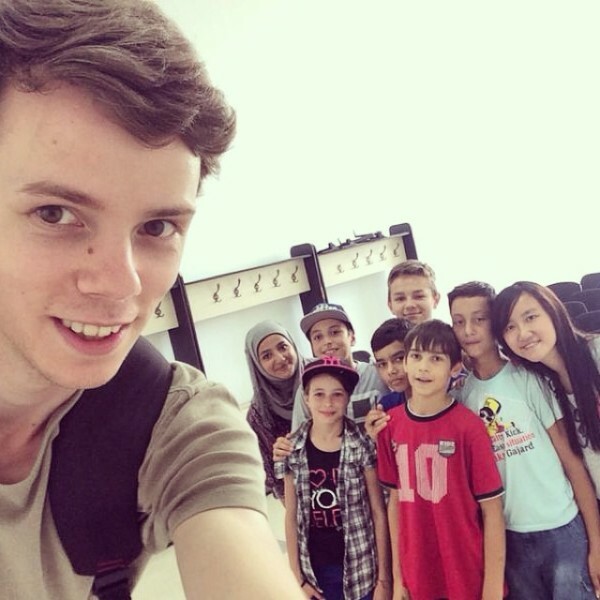 Soon, I was taken to class 1 and was introduced to them as their new English teacher. The children all stood up to greet me with a synchronized ‘good morning teacher’ while a few just murmured a simple ‘hello.’ Once they were all seated and ready for their first lesson, I picked up a chalk and scribbled ‘English’ in bold letters across the board. I was instantly nostalgic of the time when I role played as a teacher when I was five years old. I began teaching and lost track of time looking at little hands writing in their notebooks and giggling over a silly mistake. Soon, the bell rang and I was done teaching my first class. I went back to sit and wait in the library until I would be called to teach class 2. That day, I learnt a lot about myself. Not only was I capable of teaching and making the children feel comfortable around me but I realized the power every teacher holds of shaping an individual’s life. The authority of making a mark in someone’s life is one of the best feelings I have ever experienced. Think about it. You are giving a child something that he would store in her or his mind for the rest of her/his life in one way or the other. When he grows up and finally makes use of the knowledge you have provided him with, you realise it’s a priceless experience to become a teacher. Similarly, volunteering is an experience that enables you to trespass your comfort zone and achieve new heights. The minute you decide to serve a cause or an institution without seeking to gain any monetary or tangible benefits you teach yourself the importance of community ownership. It is our duty to serve other people and make their lives easy if we have been blessed with an easier and less complex life. The more we give, the more we get – I certainly live by this statement. A person must volunteer at least once in his lifetime. 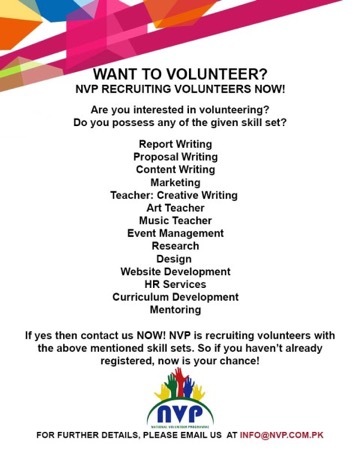 What Is the National Volunteer Programme? Find the right cause to volunteer for through the National Volunteering Programme. Volunteering presents opportunities for self satisfaction and learning. 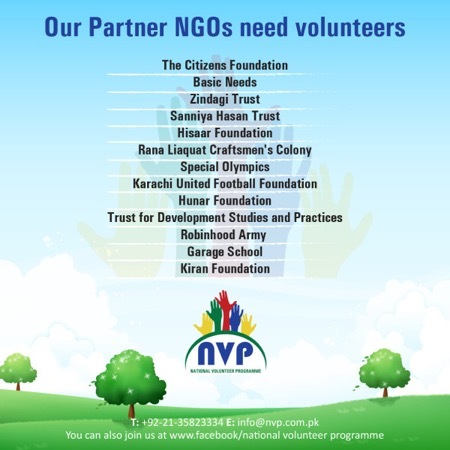 Volunteers can gain valuable experience and get involved with thousands of people working for the betterment of Pakistan. TBL is pleased to announce the National Volunteering Programme. Our Mission is ‘to be a positive change-agent in society, by providing a structured platform for all people wishing to volunteer their time for socio-economic uplift, and placing such volunteers into those beneficiary institutions which can benefit the most from the volunteers’ particular skills and capabilities’. 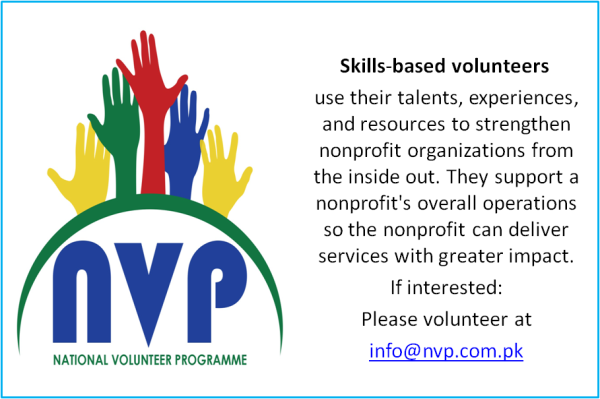 The National Volunteering Programme presents a way of matching compassionate volunteers to make a difference with the needs of a nongovernmental institution or a not for profit – the beneficiary institutions. It also gives the companies to volunteer their employees as a part of corporate social responsibility and sustainability. The beneficiary institutions gain valuable human resources which helps them further their outreach. The NVP Family Is Growing!